We at Hindu Janajagruti Samiti (HJS) have received several complaints from devout Hindus regarding a painting of revered Shri Ganesh holding a coffee mug and container painted on the exterior wall of “Coffee Chakra”. Upon reviewing, the photos sent by seekers, HJS team immediately notified and appealed to the owner of the coffee shop to remove the wall painting which is not in accordance with Hinduism. In the appeal HJS explained that the Shri Ganesh painting drawn on the exterior wall of the coffee shop may be exposed to bad weather and over a period, the wall may develop cracks, or become damp and result in Shri Ganesh’s painting getting damaged. In addition, the appeal also expressed concerns that the sanctity of Shri Ganesh will not be maintained resulting in His denigration and the whole purpose of having Shri Ganesh in a business place will be defeated. Unfortunately, the HJS team has not received any response from the coffee owner. Consequently, HJS now requests all the readers to appeal against this mockery peacefully and lawfully by either calling on the below numbers or emailing Coffee Chakra, requesting them to remove the denigrating wall painting from the shop. 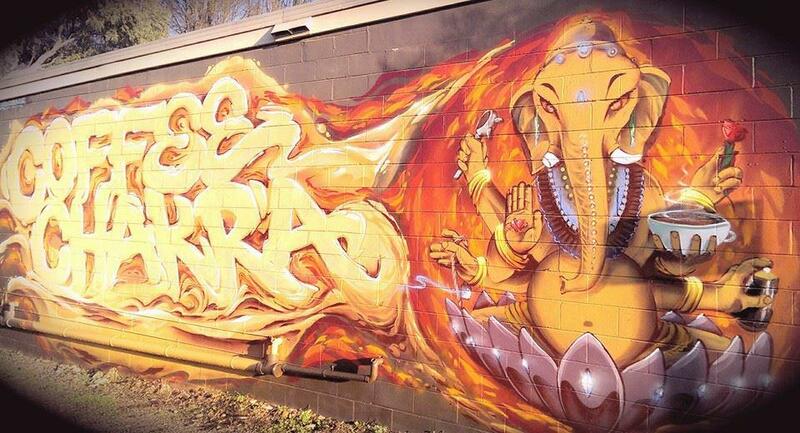 We at Hindu Janajagruti Samiti (HJS) have received several complaints from devout Hindus regarding a painting of revered Shri Ganesh holding a coffee mug and container is painted on the exterior wall of “Coffee Chakra”. We would like to bring to your immediate attention that the graffiti of the image of Shri Ganesh, is not in accordance with spiritual science as per the Hindu scriptures. In fact, this painting denigrates Shri Ganesh. Using the revered Hindu deity loosely on a wall as artwork is not only hurting the sentiments of Hindus but also trivializing them. This will set a wrong example for others and society will unknowingly be a part of this denigration. To explain more, Shri Ganesh painting drawn on the exterior wall of the coffee shop is exposed and vulnerable to bad weather. Over a period of time, the wall may develop cracks, or become damp, resulting in Shri Ganesh’s painting getting ruined or scraped. Thus, the sanctity of Shri Ganesh will not be maintained and preserved. This will lead to mockery of Shri Ganesh and the whole purpose of having Shri Ganesh in business place will be defeated. Hindus treat their divine Deities and holy symbols with utmost reverence and devotion. The commercialization of Deity for enticing customers is a cheap way to boost sales. Also, showing Shri Ganesh in any form other than as in the Scriptures leads to inaccurate presentation, and it maligns and ridicules Him. In the minds of the viewer, a fictional image of Shri Ganesh will form over a period and hence, it will obstruct the development of their faith in Him, which is most important in worshipping them and experiencing His Divine presence and blessings. The sanctity of the Shri Ganesh’s images can be maintained only in the puja room, in an altar or in other similar sattvik (pure) places. Hindus worship Shri Ganesh prior to commencing any ritual or an auspicious act. He is called the Vighnaharta, Dukhhaharta (‘Remover of obstacles’, ‘Remover of unhappiness’), etc. We urge you to consider the above points and remove the wall painting, which are not in accordance with Hinduism from your coffee shop. We stress that our aim in bringing up these points is to educate and ensure that Hindu Deities and Hinduism gets accurately represented in society. Hinduism has been misrepresented and misappropriated at many levels. Though it is an ancient tradition, Hinduism has a lot to offer the modern world and we want children and adults alike to be able to understand and study it without it being misrepresented or misappropriated. You can take one step towards ensuring that Hindu Deities and Hinduism does not get disrespected by removing the denigrating wall painting from your coffee shop. Hindu Janajagruti Samiti (HJS) is a registered NGO in India doing social, Hindu Dharma related and national welfare work. The Samiti is also active throughout the world, educating people about Hindu Dharma in a scientific way, campaigning against malpractices done as Hindu Dharma related practices and solving problems related to the misrepresentation of Hindu Dharma. For further details, please refer to our website www.HinduJagruti.org.